You are here: Home / 2017 / Transecting Hyderabad: The Communal Power of Water. Spending the past two weeks in Hyderabad has rushed to the forefront of my favorite part of this trip thus far. The large central Indian city felt like it had so much to offer: crowded streets, great food, fun bars, rich traditional celebration, and even better people. By people, I mean Hyderabad Urban Labs. 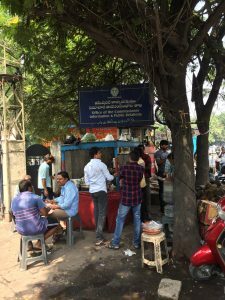 The past two weeks our group has had the chance to work along-side Dr. Anant Maringanti and his team of urban field researchers to explore the dynamic elements that make Hyderabad a growing urban hub in today’s India. As a part of our experience, HUL split us up into teams of three, and gave us an introduction into GIS mapping software. With our training, our teams set out to the streets to map something significant that we could talk about. In a city like Hyderabad, much like Chennai, urbanization and rapid population growth has caused drinking water sources to expand beyond the normal city limits and into rural areas. As the municipal population grows, the city cannot provide citizens with the resources, nor the space to settle (Maringanti, Venkatchalam). So, waterbodies closer inland towards the city get encroached upon, leading to the mistreatment and the pollution of traditional intra-city municipal water supplies. With limited options, urban environments resort to rural outsourcing for water because larger reservoirs, such as the Himayat and Osman Sagars outside the city can provide for a slightly higher demand (Maringanti). Unfortunately, this creates an issue for farmers who depend so desperately on having alternative water sources for their crops. Farmers in India cannot always rely on adequate rain during monsoon seasons. So, when cities dry up their fallback options, farmers move inland. As a result, the urban population continues to grow, the city will continue to search farther for water, and the cycle continues with problems regarding water supply remaining unsolved (Venkatachalam). Himayat Sagar found in rural areas Northwest of Hyderabad. Indian farmer points out the lack of rain and dry land formed from drought. Meanwhile for the citizens, THE LACK OF WATER in Hyderabad has indirectly created small micro-communities. Since water is a mechanism of survival, a tool, and a universal necessity, people will migrate to wherever they can find it. When the municipal authorities cannot provide an equal and adequate amount of government issued water to every home, citizens forcibly improvise. We noticed this during our walk. Our group noted how communities form around hubs of water. Outside bus stations just past the flyover in front of the Golkonda hotels, commuters crowd around food stands where drinking tanks were provided, rickshaws parked and ate lunch besides public pumps so that they could drink and wash their vehicles, and people poured out of chai shops where consumers had the choice of purchasing bottles of water or using public filtered water provided by the restaurants free of charge. North of the flyover, we saw a number of crowds around water sources provided by PAN shops, food stands, and even temples. At every public store, stand, or shop on the street that sold goods, water tanks were found easily accessible, free of charge, and open to the public. In areas south of the fly over, public stands and access points did have as high of a volume of presence, but I did notice on several instances that crowds at bus stops or on street corners shared personal bottles with those who asked for a drink. People didn’t say no, instead they gave water to those who asked for it, whether they appeared to be strangers or friends. This made me think back to water in the United States. Vinay from HUL explained to our group that in Hyderabad, a shop tender will always feel the need to provide quality customer care to anyone whether or not they have interests in his services. 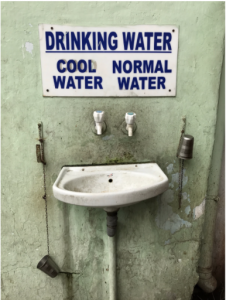 This includes providing adequate water supply to the public in order to keep people hydrated in the hot Indian heat. In the United States, the luxury of tap water provides us with the ability to never worry about accessing clean drinking water when we want it. Almost all restaurants in the United States will provide free tap water to those who ask for it. But in a developing country like India, I had an impression that because clean drinking water takes the form of a “luxury”, accessibility to the public might suffer. On the contrary to my initial assumption, our groups transect through Hyderabad’s streets taught me that although water has its scarcities, the collection of small communities crowding around individual water sources forms a larger community in Hyderabad that has a collective motive to take care of each other’s health. In a country where 75.8 million people spend 20% of their daily income on access to 50 liters of clean drinking water a day, I would have assumed that people would act more selfishly to protect their supply of water in order to survive. 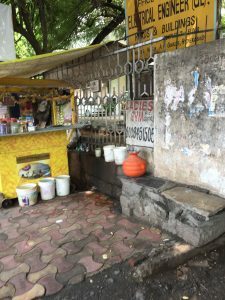 The selflessness of shop keepers, temples, and restaurant staff providing water to the public showed me that maybe Hyderabad and India in general has found ways to rally together as a community in order to solve their problems. So far, as a group we have heard depressing news about how inadequate political leadership, planning, and corruption has inevitably put India in a trap where survival as a country remains questionable due to lack of resources. So watching selflessness and communal support on the streets refreshed my eyes and gave me hope that when institutional leadership fails, human beings can still be human beings and rely on each other for what they need. Dr. Venkatchalam, Urbanization and The 2015 Flood of Chennai, MCC IGH, 2017. Dr. Maringanti, Water resources, quantity and quality in the urban environment, HUL, 2017. Dr. Venkatchalam, Economic Impacts of the Chennai Flood of 2015, MIDS, 2017.